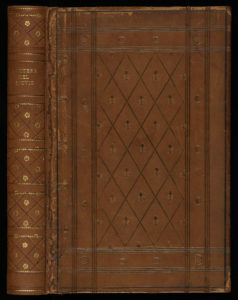 Bound in modern calf decorated with blind stamped ornaments is a collection of letters written by the sixteenth-century Italian writer, Paolo Giovio. 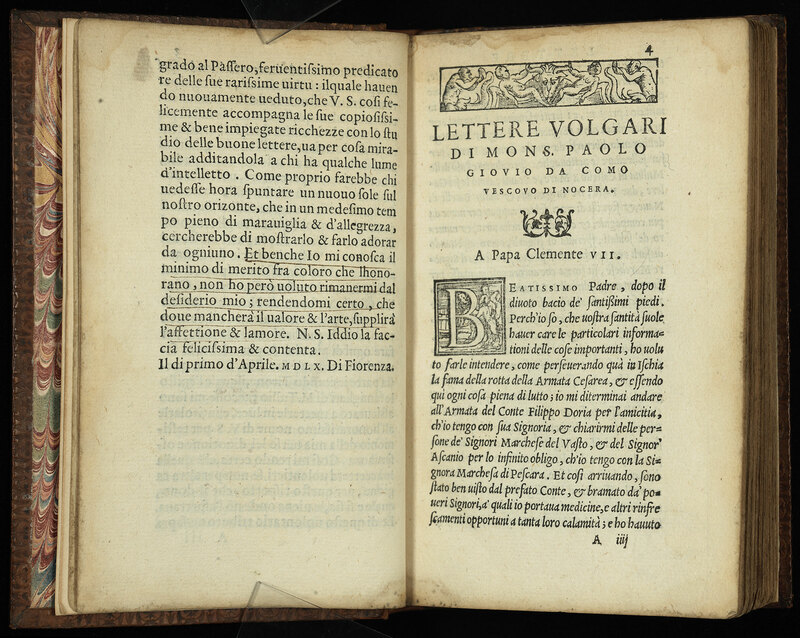 Known as a historian, Giovio became one of the foremost and innovative letter writers of his time. 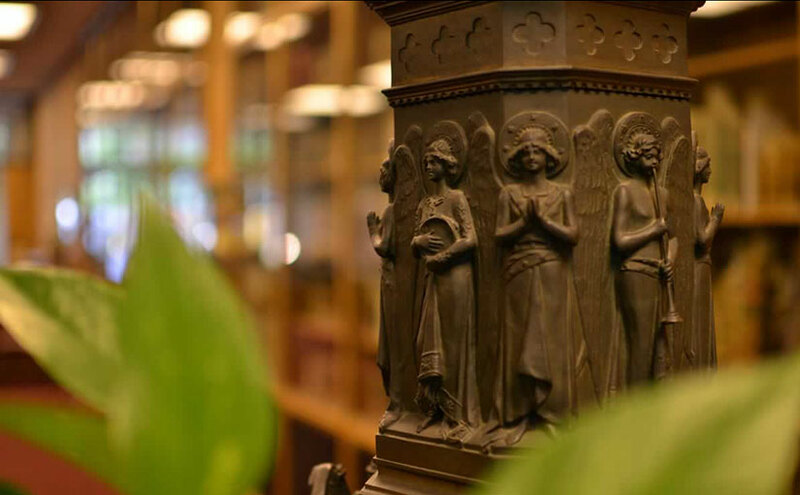 He drew upon his historical knowledge of the fifteenth and sixteenth centuries to recount in vivid detail contemporary events including the sack of Rome, the election of Pope Hadrian VI, and the Marquis of Pescara’s troops plundering his native home, Como. 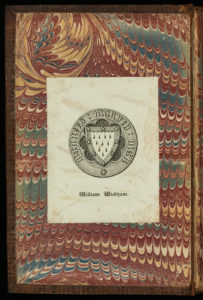 He made his biting political commentary about these events all too clear in the letters contained in this volume. Giovio practically turned the art of letter writing into a new genre; his letters in many ways were a precursor to journalism. Giovio, Paolo. 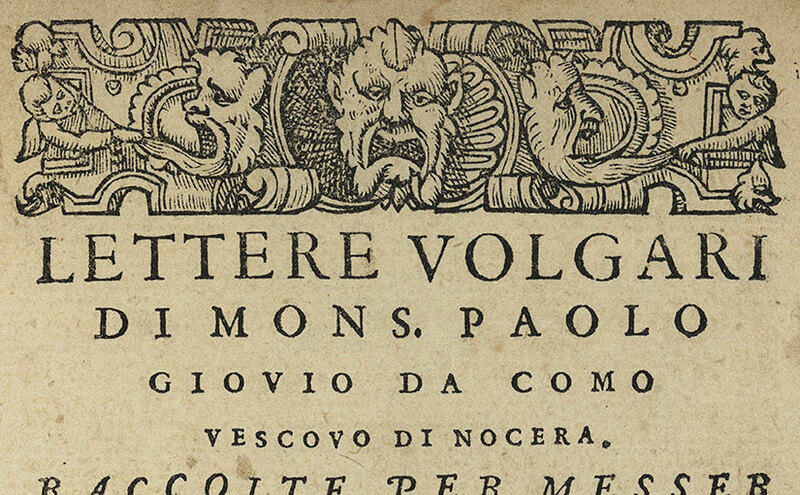 Lettere volgari di mons. Paolo Giovio da Como, vescovo di Nocera. Raccolte per messer Lodovico Domenichi. Et nuouamente stampate con la tauola. Venice: Giovanni Battista et Melchior Sessa, 1560. 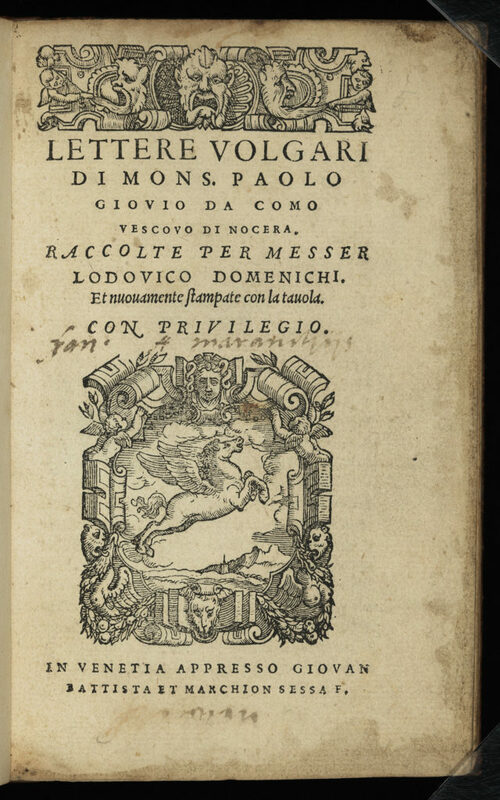 This collection of letters, titled Lettere volgari di mons, is the first edition published by Lodovico Domenichi. 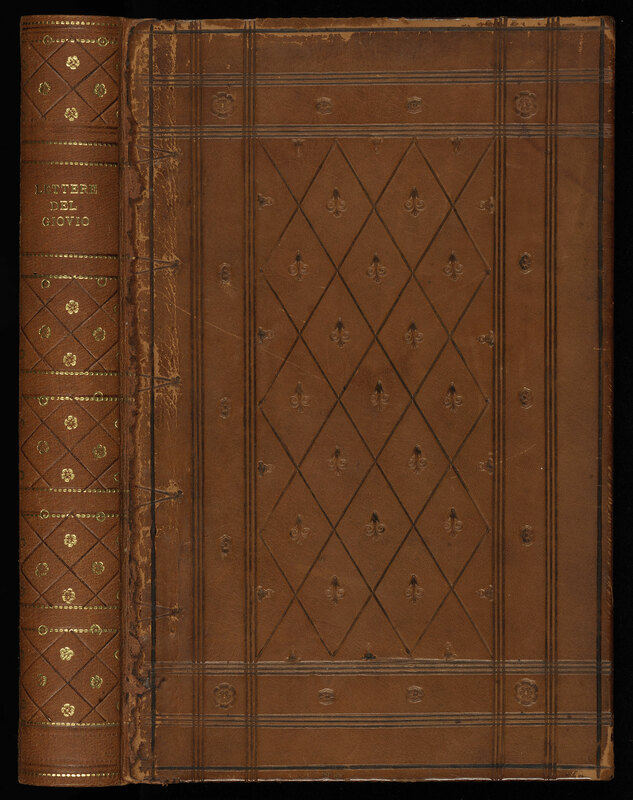 It bears the publisher’s dedication to Matteo Montenegro, a Genoese nobleman, dated April 1, 1560. 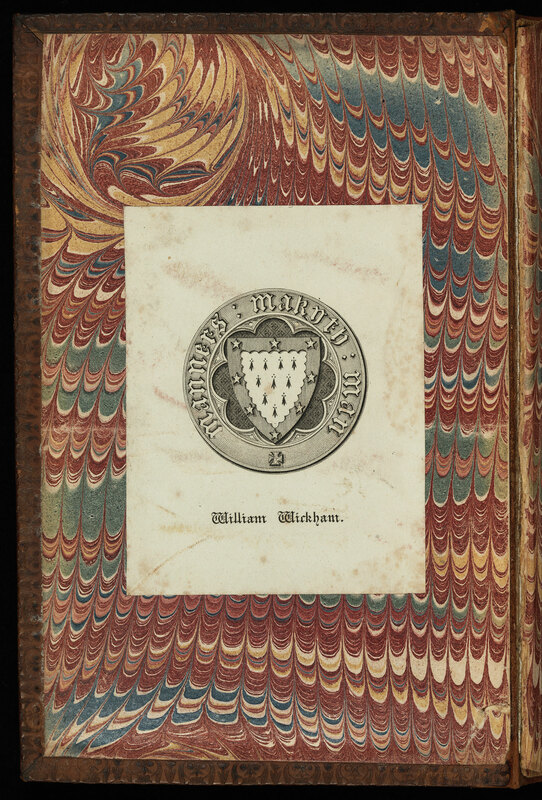 There are annotations in two hands throughout and also a printed bookplate bearing the name of William Wickham. Paolo Giovio (1483-1552), a native of Como, began studying Greek language and literature in Milan but moved to Pavia within a year to pursue medical science and philosophy, earning his degree from the University of Padua in 1511. 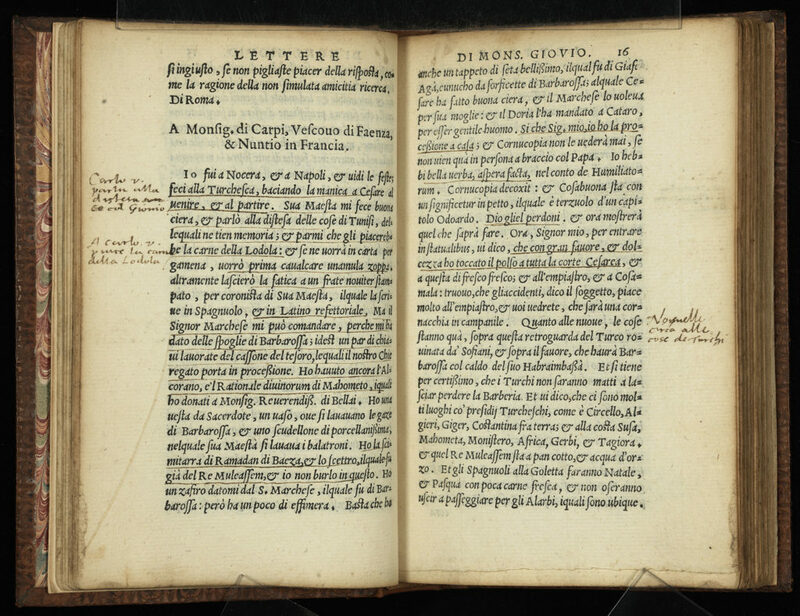 Fleeing an outbreak of plague, Giovio settled in Rome around 1516, where he wrote the work for which he is best known, Historiarum sui temporis (History of His Time). Among his other notable works are De Romanis piscibvs (On Roman Fish) and Descriptio Britanniae, Scotiae, Hyberniae, et Orchadum (Description of Britain, Scotland, Ireland, and the Orkneys).